I managed to tackle some of the tidying up on the city class gunboats, Essex and Benton, but was not able to make as much progress as I would have liked. The painting schedule for this week has been slightly unhinged, in part due to external events but also because I have felt absolutely exhausted over the last few days. I think my constitution is going into holiday mode early and coupled with a lack of sleep has meant that by the time I am home in the evening from work I am just about fit to potter about and little else. Still, on the plus side, the models are fairly well advanced and a couple of nights effort should see them finished off so all is not lost. The tidying up does not usually take long to do but it is easier if you are in the right frame of mind as rushing it only prolongs the process - in effect you can end up having to tidy up the tidying up! They are shaping up very nicely and I am especially pleased with the Benton and Essex - the former because she is a great slab of a model (she looks like a City class on steroids!) and the latter because of the curved rear casemate which was easier to make than I thought it would be! I have the funnel band colours for the City class sorted out and this will the last part of the painting process - they would have been washed, dry brushed, varnished and based before I tackle them - once I have returned from my holiday. So although I am behind at halftime there is still everything to play for and the plan to finish all 50 models by the end of June is still in place - as this is the final I also have the luxury of extra time and even penalties should the need arise! I had hoped to be able to produce more pictures of my newly painted ACW ships (which should have been finished for the most part last night) or even an update on my continuing and evolving thoughts on my Balkans project. I also cannot bring any new insights into my Napoleonic Command and Colours plans; nor the sci-fi ideas currently in the project planner - OGRE, Battletech, VSF and various others. The Minifigs ships, Memoir 44 and Battle Cry, 20mm Vietnam, scale undecided French Foreign Legion and WW1 Arab Revolt (with apologies to T.E. Lawrence) not to mention the planned scratch build of some 16th century galleys and a serious look at the wars of the late Roman republic - these all have little if any news to pass on. It is a big list of projects, ideas, dreams even - but it is a list that I have happily enjoyed scribbling about and even more important, that people have enjoyed sharing with me - usually with many helpful hints and nudges along the way which I have always greatly appreciated. The reason for this post then? Today sees my 500th blog post and that is for me, 500 reasons to be cheerful. I am quite sure I have enough ramblings to fill another 500 and so I plan to be around for some time to come - you have been warned! Many thanks to all though, for getting me this far. PS Is it me or does Ian Dury look very much like Dexter? After the relative flurry of activity of the last week and the excitement of getting the first of my ACW ships painted, reality has set in once again and it is of course time to push on with the next batch. The second nine vessels (the choice of number has purely been coinidental!) are all Union and are the seven city class gunboats (including the Cairo - pictured above in her display venue), the Essex and the Benton. The painting technique for these has varied slightly from the Confederate ships in that I have painted the decks first (using Humbrol HC5 - Mast Oak) before moving on to the metalwork. These have now received two coats and so this evening will see the hulls duly painted in a base coat of very dark German panzer grey colour. I think I will be able to get these models painted by the time I go away on holiday although I will have the extra complication of painting funnel bands on the city class - something I am not looking forward to! I finally managed to get the clear plastic bases, name labels and flags finished for the first nine ACW models and so here they are. First of all we have the CSS Louisiana and Mississippi. The former was actually built and finished but sadly only the paddle engines were connected and so she could barely make 2 kts and so was towed into position and used as a floating battery. Mississippi was not completed hence the name being in italics. The next pair, although related in that they are the same casemate ironclad type (loosely called the Columbia class), are the Texas and the Columbia. Columbia when launched was reckoned on being the best built of all the Confederate inronclads but sadly she ran aground and broke her back. Texas was never completed (so will need to have the name label changed to one in italics...D'oh!). The smaller casemate was designed to reduce the use of increasingly scarce raw material as the war went on. The CSS Arkansas needs no introduction as the ship that ran past the Union Fleet to Vicksburg. 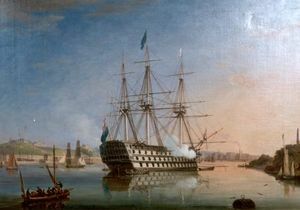 Her sister, the Tennessee (1), was burned to avoid capture whilst on the stocks at Memphis. Finally we have the 'Odd Squad' - the Missouri, the Baltic and the Manassas. The Missouri spent the entire war on patrol around Shreveport - her draft was such that not only could she not get at the Union they could also not get to her! She was unusual in that she had a centre wheel that that strictly speaking should probably have been uncovered. I have followed Gibbons in this and allowed for a cover (it makes the models a whole easier to build!). The Baltic was in very poor condition and so her armour was removed and used to plate the Nashville. Finally the Manassas. A great idea - based on Winan's 'Cigar Ship' idea from the 1850s - but sadly she was woefully underpowered (a very common problem for Confederate ironclads) and for ram to only be able to make 4 or 5 knots her career was always going to be a short and interesting one - and so it proved to be the case. The clear plastic used for the bases (with the addition of some 'waves and wakes') was not the easiest of materials to use - I rather thought it would be like a transparent version of ordinary plastic card but this is not the case. The surface is like glass so there is little purchase for a knife. I ended up using a bradawl to score the lines I needed and then snapped it along the line. You can cut it with scissors - I discovered this at the end naturally. You can file the edges reasonably well although you do get the inevitable plastic friction melt which is tedious to remove. To be honest I am not sure about the bases although they are certainly effective on a variety of surfaces. I think I may have overdone the white slightly but having said that, I am pleased I opted to use this method as opposed to painted card. They are now officially finished! For a variety of reasons I was unable to make my weekly visit to the club this evening and so I took advantage of the spare couple of hours to tackle some more work on the ACW collection. The first nine models are now at the 'wash and (dry) brush' stage - the flat colours are finished and so it is now just the artistic stuff to take of. At this point in time they look a little plain to be honest but once the finishing up has been taken care of they will soon look much better. I have printed out the name labels and flags and will be chopping out the bases tomorrow evening. Everything is on schedule for the photo shoot for the blog on Friday evening and I can't wait to see them finished! In addition to the nine Confederate vessels I will be starting the nine Union gunboats as I have decided to really give these a push to try and finish them before I go on holiday. Originally I had planned to paint the entire collection in four batches but it now looks more like being five - either way and assuming nothing untoward happens, I am aiming to finish the entire collection by the end of June. 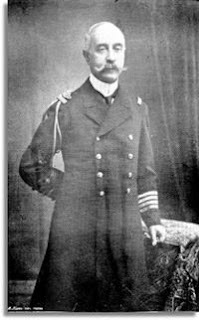 Just as a quick update really - I have made some progress in identifying the ships of the Greek navy in use in 1900 for the forthcoming Balkans project - and also the uniforms for the Bulgarian infantry so the data bank is growing nicely. For the land side I merely need to acquire the Greeks from Irregular Miniatures and a selection of 1900 era artillery pieces to have just about everything I will need to kick this off in due course. As mentioned previously, I shall be basing the armies individually using 1 and 2p pieces and have opted to use the pre cut MDF bases available from Warbases - http://www.warbases.co.uk/ - for the movement trays. P.S. For some lovely inspirational 'eye candy' take a look at this website: http://members.upnaway.com/~obees/soldiers/other.htm I would suggest sitting away from the computer whilst doing so as the subsequentt drooling over the keyboard will not do it any good. Hiding the wallet would probably be a good idea as well. You have been warned! No, it is not some weird ACW fantasy type game - the Nazgul analogy refers of course to the nine Confederate ironclads currently nearing completion. It has been a pretty productive day all said and done - the painting has moved along very nicely and a couple of ACW admin tasks have been completed and so I am feeling pretty pleased with myself. The ships are now at the hatches and funnels stage which, when completed, means I will be able to move onto the 'artistic' phase. This is the 'black wash and metal dry brush' part of the process which will finish the models off prior to being based on the clear plastic I shall be using. The admin tasks were all related to the ACW collection - I have finished drawing up the list of names for the model bases and have organised the flags (with grateful thanks to Dave Manley) as well. Finally, I have made start on the additional ship cards to go with Dave Manley's Man 'O War ACW Ironclad variant (which I shall be using with the collection when ready). As mentioned in my earlier post I spent some time this evening painting the decks on the nine Confederate casemate ironclads. I have managed to put on not one but two coats of Humbrol HC4 Deck Plank. I was a little worried about this tin of paint as the last time it was used was when I painted the Black Sea Russian Fleet and so I was convinced it would a congealed lump in the bottom of the said tin. Happily this was not the case and it covered well and dried quickly, hence the second coat. There was an added bonus using this as well. The deck sections I have painted have an almost planked look by virtue of the grain in the wood so I will need have no fears about the decks appearing as smooth as glass. I had originally considered painting the ironclads in different shades of grey to better represent the somewhat haphazard iron sourcing problem the South suffered from. I then reasoned that it would be extremely unlikely that the Confederates would ever be organised enough to have more than one or two ironclads in action at any one time and in the same place so having them painted the same and almost uniform in appearance would not matter overmuch. The plan for tomorrow evening then will be to touch in the edges - those areas where the deck and metalwork join - and then think about the hatches and funnels. the black wash will go on when the flat painting has been finished and then I shall dry brush the metal surface first in a lighter grey and then with a metal colour just to sharpen up the edges. Assuming I have no bumps along the way then these will be finished at the weekend. I shall be keeping a running commentary going on the progress of the ACW collection painting project which will be numbered in parts so should this not be of interest - look away! Seriously though, it helps me to maintain the momentum of the undertaking by noting my progress (or lack of!) on the blog. This morning, I managed to get up at 5am (you know the scenario, you wake up prior to the alarm going off and it is fairly pointless rolling and going back to sleep again) and so I took a look at how the first stage of the Confederate casemate ironclads had dried out. Unsurprisingly for a twenty year old tin of Humbrol enamel the finish was slightly 'oily' in places. With any new tin of Humbrol I always shake the tin and stir the paint and shake the tin again for what seems like an age but it always happens that you get the 'oily' finish. I was expecting this and in truth had allowed for it and so I gave the models a second coat this morning with the spare half and hour I had. The paint is now fine and will be so until it dries out or is used up. An old wargaming friend of mine used to open his new tins of Humbrol and leave them overnight in order to allow some of the oil to evaporate off but I have never bothered with this. Applying the second coat has also served to disguise some the wood grain at the bow and stern which is always useful. My plan for this evening is to paint the decks. This will be the first rough coat and so I expect to be giving it a second coat in the morning before 'tidying up' the edges. All being well I will have all nine of these finished by the weekend and pictures will of course follow when ready. I finally kicked off the actual painting of the ACW ships (not the undercoating, the real 'brush-in-hand' stuff!) and as mentioned previously have started with the nine Confederate casemate ironclads. I shall be painting the models with a combination of enamels and acrylics - primarily because I have hundreds of tins of enamels - and will detail over the coming weeks the colours etc I am using as the task progresses. The first step was to paint the hull sides and the casemates themselves and for this I used Humbrol 140 Matt Gull Grey. This is a nice mid grey shade that will take a black wash and a Games Workshop Bolt Gun Metal acrylic dry brush afterwards for that battered and unkempt iron look. I will keep the dry brushing to the casemate edges and the lower gun ports so it will give a degree of depth to the model without being overly artistic. My choice of enamels for the main paint job was made for a couple of reasons - the first of which being the availability aspect - and a major consideration was the fact that enamels are 'thicker' in terms of coverage and so any irregularities in the model surface would be minimised to a degree. These ships should not take long to complete as they are fairly basic in terms of what could actually be painted. There is very little other than the wooden decks with perhaps a hatch, a plain black funnel and lots of metal I will try to get them ready over the next week with a view to posting pictures at the weekend. I will be using the grey paint mentioned for all 'natural' iron and so having a couple of tins is pretty handy. 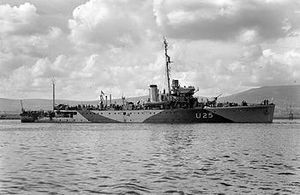 The Union City class gunboats will be black metal, as will the Benton and Essex. I was happily perusing the new game shop that has just opened in Rayleigh - Gamerz Nexus - when I was overcome by the dreaded 'shiny-new-must-have' syndrome. I am quite sure that most fellow sufferers have experienced this on the odd occasion and so I offer no apologies for my fall from grace. The shop primarily caters for fantasy gaming - either miniatures based, role-playing or collectible card games - and there are wonderful bits and pieces in the shop to look at. I happened to have popped in there purely to acquire some Army Painter white primer (which was duly obtained and very nice it is as well) and came out with not only the aforementioned spray but also a copy of Spartan Games rules for their game of Victorian Steampunk warfare called Dystopian Wars. The basic premise for the gaming universe in question is that the industrial revolution occurred decades before it actually happened and that great airships battle above the clouds, huge warships blast each other on the high seas and land ironclads drive all before them on land. Supporting the rules are the inevitable miniatures for the major power blocks and very nice they look as well (although I will qualify that later in the post). The game is described as following on from their fantasy naval set Uncharted Seas and a deep space set called Firestorm Armada so I presume that many of the mechanics have a common origin. I have yet to read the rules in detail although they seem fairly straightforward and so when I have had the chance to peruse them I will report back. The production value of the rulebook is very high and in terms of eye candy the illustrations and photographs of the models available are very nice indeed. It seems to be almost obligatory these days for a rule book to be copiously illustrated with background material and ideas for games and in this respect Dystopian Wars is right up there with the best of them. In terms of the gaming universe it delivers exactly what it says on the tin although having been spoiled by that included in Wessex Games Aeronef the Background could have been fleshed out a lot more in my opinion. Aeronef and Land Ironclads have a much more alternative history based approach and so the back story is more 'rounded' than that in Dystopian Wars. Having said that, in my opinion Wessex Games lose out by virtue of missing the naval element at the moment although when Aquanef (the VSF naval set) finally appears it will redress this enormously. The rules and background from the Wessex stable are really an extension of history in my opinion whereas Dystopian Wars seems to have been almost dropped into 1870 on a fully operational 'done deal' basis. The ship models are very nice and beautifully detailed (made from Resin) but overall just don't do it for me - that is not a reflection of the quality or the ideas which are extremely good - but that is just my own personal beef. The game is set in 1870 and so I would want to see warships that looked vaguely like they belong historically in that year. There are enough actual historical types of the era that could be 'tweaked' into something a little more fantastic and as I say, they are lovely models but not my cup of tea. I am not keen on most sci-fi/fantasy ranges simply because I have my own ideas on what 'stuff' should look like and whilst many of the ideas presented (the Prussian Dirigible Aircraft Carrier is a good example - think Hindenburg with a flight deck - and one that I shall certainly 'borrow') are very interesting I have a number of my own thoughts on how to model this 'era' - which will probably not be to anybody elses taste. To each his own I suppose. I am really not sure what I will do or how I will progress this and with hindsight it may be seen very much as an impulse purchase BUT....I am very interested in the idea of VSF and how it can be translated into a game and so this is very much a valuable part of my data bank of ideas and inspiration. I would certainly try the rules out but would use my own (scratch built) models. This coming weekend will see the ACW collection under the brush (or rather spray to begin with!). In the run up to this I have been considering not only colour schemes for the ships involved but also the techniques I shall employ and the level of detail I want to go to. The models are quite basic in respect of detail and as I have mentioned in the past, they remind me of large sized 1/3000 types - particularly those of Davco with their exaggerated height. Clearly a hugely detailed 'artistic' paint job would be wasted on them so I am not expecting washes and extensive shading and highlighting to be used. The paint scheme will be very much in the 'Toy soldier' realm i.e. bold and flat colours. I have not decided yet how to tackle such things as doors and windows and one idea I have been toying with is to use waterslide transfers for such - you can buy sheets of this and in, effect, desgin your own which would be really useful (not only for this project I might add!). This idea may also help to solve the problem of the 'fantail' effect on some of the side wheel steamer paddle boxes. Armour is another area of concern. I do not want to paint ironclads in metal colours. The technique I want to experiment with is to use a base non-metal colour and then dry brush the angles etc with a metal shade. This will be particularly useful for the dark armour of the Union Cairo class gunboats which appear almost black to look at. I may even experiment with using a pencil to 'line' the armour to represent rails etc although this might be a technique too far for the quality of the detailing - they are purely representational after all and not scale models. I intend getting all the basic painting tackled first and then to mess about with transfers etc before finishing the models off prior to basing on the clear plastic. I have spent some today pondering the naval side of my Balkans project - this will follow on after the land element is in a game able condition i.e. I have two sides finished and ready to use! The main fleets will be the Greeks and the Turks and I am reckoning on there being around 50 models combined for the two. Add to this the representative Great Powers then the list easily heads up towards the 100 models mark. I should point out though that half of this will be torpedo boats of various types. The ships covered will vary from state-of-the-art (for 1900 anyway) pre dreadnoughts through old and new armoured and protected cruisers and central battery ironclads. In short, a real mixture of old and new. I will spend some time during my forthcoming holiday deciding exactly what I shall be needing to make for the fleets - the historical stuff can readily be sourced but I will need to do some digging into what Eric Knowles used to refer to as 'never was-ers'. These are those ships that were either ordered and never built, built and taken over or merely existed as a set of plans. The situation in this respect is fairly well covered for the year leading up to WW1 but less so the further back you go. I realise that this all seems a little in advance (I will not get to the models until at least the 4th quarter of the year) but once I have this aspect bolted down I will be able to concentrate fully on the armies as they must, in all honesty, come first. I like to think of ship modelling as being my prize for painting the land forces first! The ACW naval collection is now filled, sealed and ready for undercoating which I shall be tackling at the weekend en masse. I am unable to do this any sooner because I need to do this outside and I also have to get some spray primer. In the meantime though, I shall get the name labels ready and printed and sort out the flags for the bases. To fill in the time then, I have been giving the Balkan project some further thought and have been checking out uniform sources. Turkey and Greece are absolutely fine in respect of the figures available and all that will be needed will a paint job. The Greek uniform changed over to Khaki after the period I am looking at and although the new tunic has patch pockets on it as opposed to the earlier plain, French style version the paint will take care of this. The officers will be (under the Irregular suggestion) Japanese Colonial/1905 vintage figures. 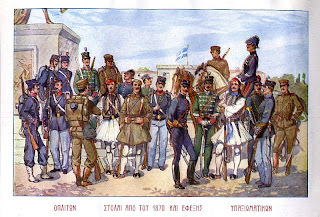 Again, the distinctive Evzones will merely need a paint job for the earlier uniform. 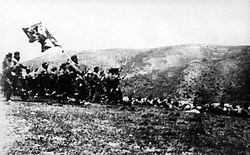 I am still digging around for information on the Bulgarian army of the era - there seems to be plenty about but sadly my Bulgarian is not up to much! I have settled on a 'toy soldier' style of paint job and am seriously considering basing the figures individually with some trays for bulk movement. I am some way from this being a pressing decision though! The naval side will again be fairly simple to organise. I plan to have the Greek and Turkish navy built as they were for 1900 but will add to them those ships that they gained between 1900 and 1912 but earlier versions of them so, for example, instead of the Greeks acquiring the armoured cruiser Georges Averoff they will acquire something older. Similarly, the two ex-German battleships the Turks gained will be earlier ones. The twist will be that the ships the two nations gained historically up to 1914 after the Balkan Wars will instead be state of the art 1900 ships. In effect, I am resetting the naval clock whilst maintaining a modicum of feasibility. For practical reasons it will also save some tricky turrets having to be built! Today SWMBO and I went to our local 'lazybones' boot sale - so called as it opens at 10:30am which is far more civilised than the usual dawn kick off - and I had a wonderful time! First up, and inspired by Bob Cordery whose collection of foreign buildings acquired from his various travels is enormous!, was a lovely set of ceramic Greek style buildings which are absolutely ideal for my 15mm Balkan wars set up and originate from, ironically, Corfu - which is where I am heading in a couple of weeks. I plan to acquire some more of these whilst I am away under the general heading of 'souveniers'. These five buildings cost me the princely sum of £1. Next up was a little more expensive at £10 for the six - the sixe being a selection of hardback titles from the Osprey Battles of WW2 series. These are basically hardback versions of Osprey campaign series titles. I already own 6 of these and so adding a further six was a welcome addition. the titles are 5. Libya 1940, 6 Tobruk 1941, 7 Iraq 1941, 8 Crete 1941, 14 Gazala 1942 and 17 El Alamein 1942. Considering that an Osprey campaign title goes for around £15 a volume acquiring these six for £10 was an absolute bargain. Finally, I managed to acquire a sealed copy of the two disc special edition of the classic sci-fi film Alien for a £1. All in all then, It was a pretty good days bargain hunting. P.S. Sorry Bob, no sign of anything even remotely Britains looking! The two stern wheelers will be finished later today - one merely needs some additional fitting out whilst the second needs the wheel mount built. This part - the mounting for the stern wheel - has proven to be quite taxing and the solution I have opted for works well but it does mean that all my stern wheelers will have the same fitting. I have also rather cunningly chosen not to mount the actual wheel itself until after the hull is painted so that the wheel will be far easier to get at with a brush. I also need to add some more gunports/hatches to the three timberclads but once this is done the whole 'schuck and jive' will be finished. No you are not seeing double and no, I have not built another pair of the above ships! the original versions of these were way too tall with paddle boxes that were almost cathedral-like in their dimensions. I had looked at this models with growing dissatisfaction until at last I took the decision to reduce the height by a fraction. The task was actually quite simple as all I had to do was to remove the gun ports and then take off the entire plastic roof section. the exposed wooden hull was then sawn right across the model's cross section and then the roof was reattached. There were a few heart-stopping moments but all in all it was fairly straightforward and the end result looks far better and in proportion. the picture above is of the new version whilst the one below is of the original for comparison. USS Tuscumbia and Chillicothe - version 1. Note the huge paddle boxes. I have absolutely no intention to 'tweak' any other of the models I have built but these two were in dire need of some attention. Proportionally they look so much better in their new rig and so another modelling itch has been well and truly scratched! The two stern wheelers should be finished over the weekend - the only difficulty I am having is in finding a suitable bracket to mount the wheel to. Once this has been overcome they will be ready. I am hoping that a simple solution can be found which can be easily replicated as I think I shall be needing to make a few of this type of vessel. Fortunately, they are far easier to make than side wheelers. 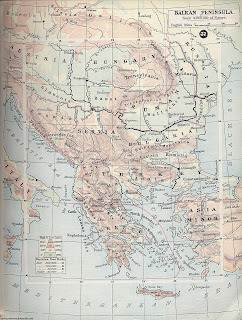 Above is a rather handy map of the Balkans in 1900 which will be the era of my forthcoming project. The essential difference between 1900 and the war in 1912 is that it was pretty much a free for all in respect of who could potentially be fighting who - all the while being mindful of the Great Powers stepping in. In 1912 initially it was everybody versus the Turks until after they were beaten when Bulgaria became the villain of choice. 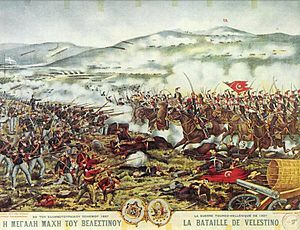 The politics of the era were truly Byzantine in their complexity but there was one consistent fact that influenced most national agendas - that being the crumbling of the Ottoman Empire and the jockeying for pole position to pick up the inevitable pieces. Most of the European nations of the region had their own ideas of exactly what that wanted in terms of territory which led to much in the way of petty squabbling, sabre rattling and political brinkmanship. From a gaming perspective the period has not only the attraction of some truly exotic and colourful troop types but also everybody fought everybody at some point so there should be no problem organising a battle! The equipment in use would vary from the most modern (in very small quantities) to some quite antiquated kit from as far back as the middle years of the 19th century. 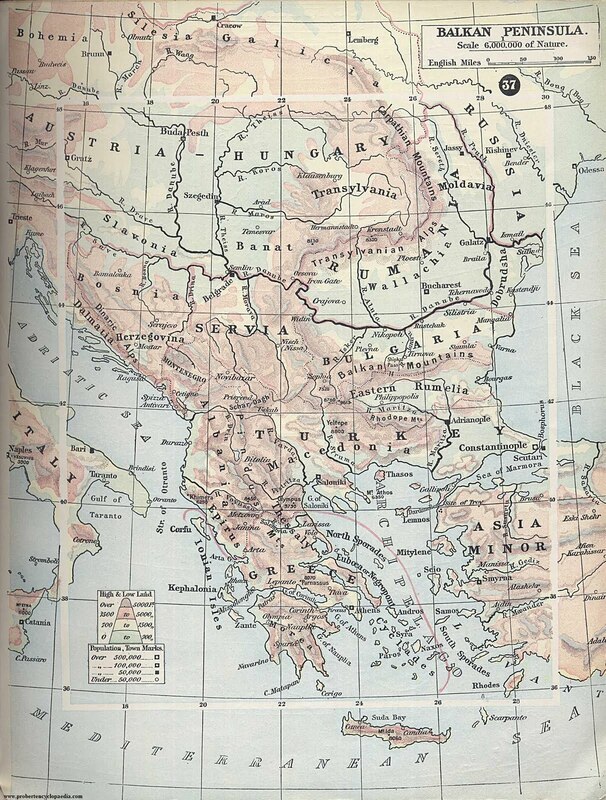 At the present time I have both the Turks and the Bulgarians but will also be acquiring the Greeks, Serbians and Montenegrens in due course. 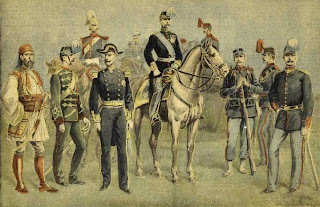 The armies are sized at what can best be described as double sized DBA - roughly 24 to 30 bases with regular infantry based in 3s, cavalry and light troops in 2s and guns etc with 3 gunners for field artillery and 4 for heavy. The bases will have 40mm frontages and will be for use on my Hexon terrain. The naval side will of course feature and the models will be scratch built to fit in with my Hexon 'sea' tiles so the biggest ship will be around 3 and a half inches long and of course, this will mean Victorian liveried pre-dreadnoughts. I have a useful map of the region for the naval side from the Great War at Sea Mediterranean boardgame. The rules for this game also feature a nice strategic movement system that may be called upon should the need arise. The Balkan fleets will be larger than they were historically but only to give an extra dimension to the action - my current thinking is to have 15 to 20 year old cast offs from the Great Powers polished up and sold at a knock down price to whatever power wanted them ("One careful owner who only used it for reviews, honest guv'nor!"). ....My four sheets of 1mm thick clear plastic card sized at 9" by 12". This will be what I shall use for the basing of my ACW naval collection when painted. I plan to brush on the waves and wakes in white and apply the obligatory name label and the naval ensign for good measure. I 'mocked' up a model on a base to see what it looked like but as the entire ACW collection is still at the pre-undercoat stage you did not really get the right effect and so there are no photos as yet. There will be soon though - I promise! Lest we forget - today is of course Star Wars day. Of the three models the Lexington is in the centre flanked by the Tyler and the Conestoga. The Tyler and Conestoga were described as being very similar in appearance except that the paddle boxes were slightly different. As I have only been able to find pictures of one of them, the Conestoga I have built both models to the same configuration. These are the last side wheel paddle steamers I am building for the river part of the collection although I will need to build a few when I tackle the Gulf end in due course. In the meantime though I am now left with having to build only two more vessels to finish this phase of the project - a pair of sternwheelers for the Ellet Ram fleet. This will bring me up to 50 models - more than double than what I had originally set out to build! Well not exactly going with the wind although both the CSS Governor Moore and the CSS Stonewall Jackson were rigged for sail. The first ship, the Governor Moore is a large ship and is the only model thus far to have a double thickness hull. There will be a lot more of these when I tackle the Gulf end of the action and so I was pleased at the way she came out. The Stonewall Jackson is more or less identical in layout although smaller in size and she also only mounted a gun at the rear. Bearing in mind she was fitted out as a ram that is probably no bad thing - at least as far as the gun crew probably thought! I was not able to model the cotton bales on either of these two for the simple reason that my supply of Milliput (I know, I had spelt it incorrectly in my previous post!) had dried out and was rock solid. The fact that the price ticket on the box still had the name of Beatties on it will give you some idea of exactly how old this must have been! The final model is another gunboat and is the fourth such model I have in the collection. These are the final models for the Confederates for this part of the project and I have enjoyed enormously making them. Next up are the three Union timberclads and then it is just a pair of stern wheelers for the Ellet Ram fleet and I am done. By now I am sure that many readers in the blogasphere will be aware of the very sad passing of Richard Holmes at the age of 65. I never met him; not did I attend any of his legendary lectures - but his approach to military history through both his writing and his television work was such that you almost felt as though you knew him. His writing and broadcasting were very 'human' in their approach and his enthusiasm was infectious, his knowledge, exceptional. I am sure that most readers will have their own particular favourite amongst his writing and television work but for me it will always be 'Riding the Retreat' his combined history and first hand guide to the retreat to Mons in 1914. In this book he undertook to ride the route taken by the BEF with some members of the Guards and what struck me about the story was how effortlessly he was able to switch from serious history to amusing personal anecdote at the drop of a hat. Usually, I hasten to add, with descriptions of long and boozy roadside lunches! A quite superb read. He also introduced the reader to 'Thatch' - the horse that ate Europe and terror of the topiary with an unreasonable dislike of black polythene dustbin bags. Of such writings are legends made and if ever a military historian deserved that accolade then it has to be Richard Holmes.